Fudgy coconut squares take most of us on a trip down memory lane! Making up a batch of these takes a few minutes…store them in the refrigerator and bring them to room temperature before serving. I am a lover of anything with coconut…coconut ice, coconut clusters…coconut creme brulees and coconut THESE squares. Line a square casserole with butter, and a layer of plastic wrap. Let the plastic wrap drape over the sides of the dish. Grease the top of the plastic with butter. Place the sugar and water in an AMC pot on medium heat. Stir continuously until the sugar dissolves and bring to the boil for 2 – 3 minutes. Add the ground cardamom, desiccated coconut and milk powder. Stir well until the mixture starts to leave the sides of the pan and form a ball. Press the warm mixture into the greased dish. Fold the plastic wrap over the surface. Use your fingertips to smooth the surface. Once the mixture has cooled, cut into squares. 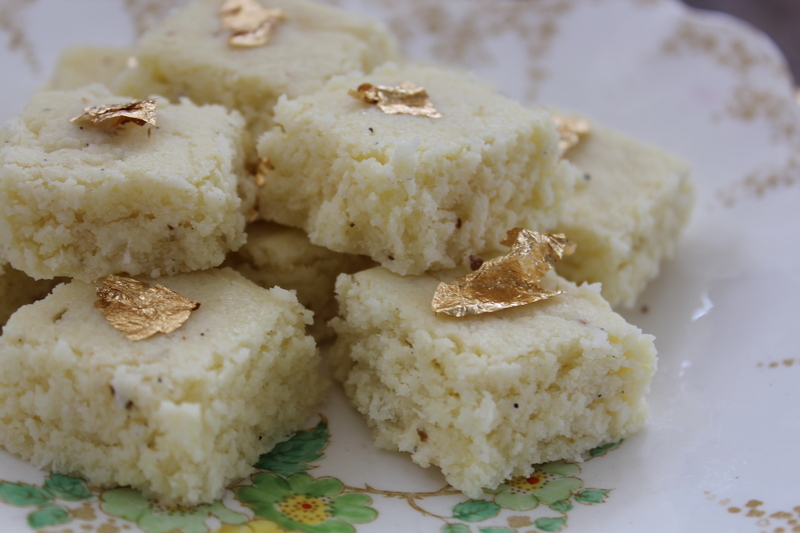 Decorate with pistachios and gold leaf. While I was trying to get my thoughts together, the lovely Catherine Robar from WFP Lesotho, beat me to putting some of my thoughts down…. Laddoooooommmmaaaa – scoring a Diwali goal! Ladoooma! Scoring some Diwali goals! My son, Rushil, runs around screaming ‘Laduma’ every time he sees a Laddoo. These are made not only at Diwali time but whenever there is a prayer. Combine the sugar and water in a thick bottomed pan. Stir until the sugar dissolves and then bring to the boil. When the syrup thickens slightly, remove from the heat. Add the food colourings and stir. Add more food colouring if necessary. Place the chickpea flour in a large mixing bowl with baking powder. Add enough cold water to make a thick batter. Hold a colander over the hot oil and press a little batter through. Fry the batter droplets in hot oil and remove when they are light golden brown. 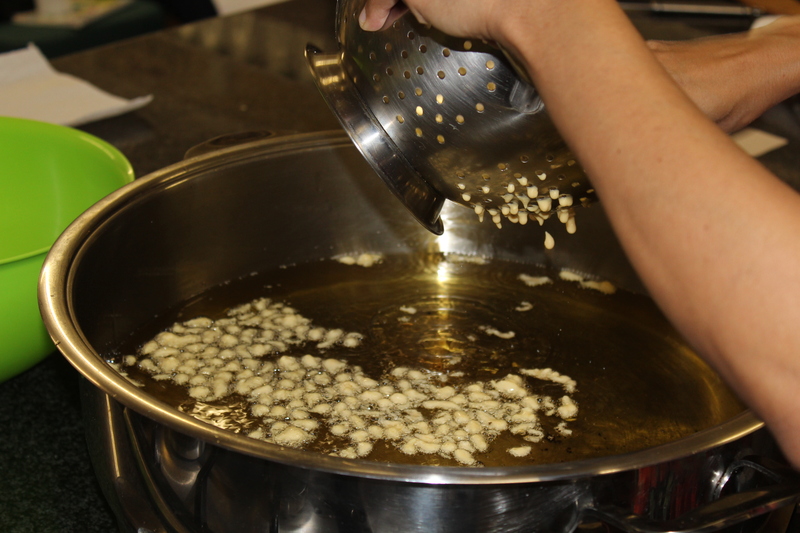 Drain the cooked droplets for a few seconds and then place them in the warm syrup. Repeat until all the batter has been fried and soaked in syrup. Sprinkle the ground cardamom over and leave aside until the syrup has been absorbed. 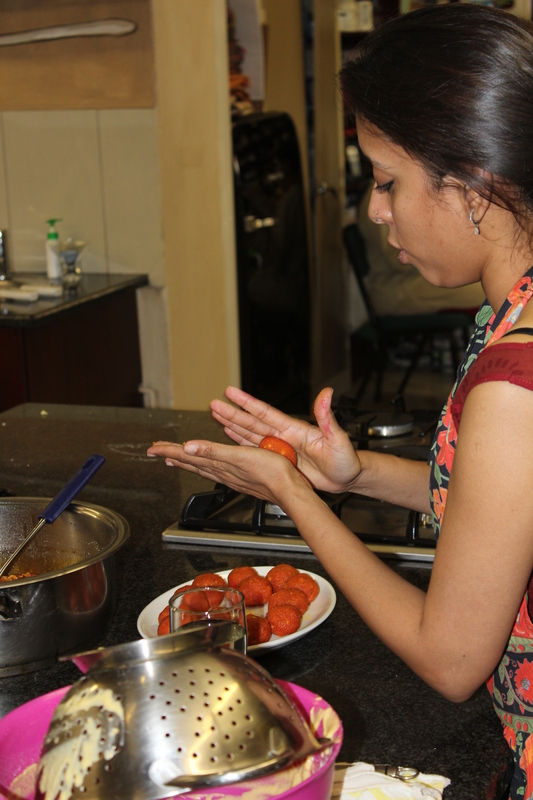 Grease your palms with a little oil and mould the mixture into balls – they are quite sticky at first but do dry out after a few hours. 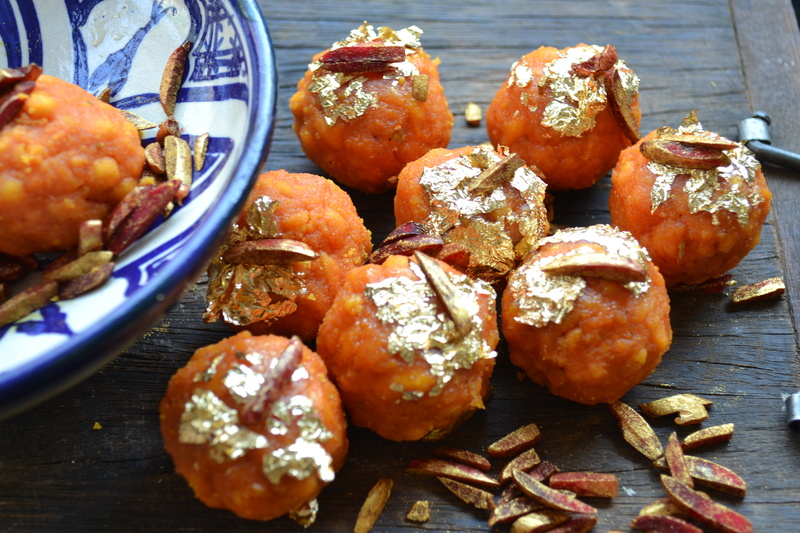 Garnish with tinted almonds and gold leaf. The syrup must not spin threads when it is tested – it should still be thin enough to penetrate the fried batter droplets.